Something that has always really bothered me in Wolverhampton is the lack of choice when it comes to food and I am mainly referring to the city center, as there are a few small independent businesses that have fashioned a place for themselves within the boundaries of WV, but the city centre has always been a bit of a joke. If your satisfied with KFC, McDonald’s and Subway then you’re going to love it here but the majority of us (millennial’s especially) want and need a lot more. We are all increasingly enthusiastic to experience new things and try food and drink we maybe haven’t had access to before. This is why I am trying to do a series of write ups centered around the few local newcomers that are trying to make a difference and offer us an element of choice, innovation and food with some heart. If you are local and you care about food enough to take a leap of faith on that idea that you have had bubbling away under the surface for as long as you can remember, then we want to speak to you. Whether your making waves in Wolverhampton or within your own town or city, you deserve as much spotlight as we can give you. First off the bat is the wonderful Feast Foods. Feast Foods are a vegan and vegetarian food delivery service based in Wolverhampton that offer clean, natural lunches available Monday to Friday and right to your place of work. After trawling through the city streets desperate not to settle for a Sainsbury’s meal deal many times it is music to my ears knowing that someone is putting their energy into giving people a healthy alternative to the usual suspects. I caught up with the mind behind Feast foods, Nadiah to find out more. Hi Nadiah, so How did Feast foods come about? I have always enjoyed making a lovely lunch to look forward to – it’s all I think about and I count down the hours until I get to sit and eat something delicious. Everyone would comment on my lunch that I had rustled up and would always ask for a little taste. There was defiantly a lot of food envy going on! It wasn’t until a friend of mine approached me to make what I was going to have for lunch for him as well, that I started making extra lunches for friends and family. Before I knew it, friends of friends and colleagues were asking if they could also order a lunch from me, and so FEAST was born. It’s as simple as that. Who are the Feast foods team? Me, myself and I. The FEAST team simply consists of just me (Nadiah). I am the brains behind FEAST and I cook every order myself. I do everything. Are you looking to challenge the common attitudes towards vegan and vegetarian diets? Some people might think it can be quite limiting. I am not necessarily trying to convert people to become a vegan or vegetarian. However, I do think it is very important for people to understand where their food has come from and what they are eating. People are not aware of the health and environmental issues eating meat and dairy have, and there’s a misconception that a meal has to contain meat or dairy to be tasty. My father, who is Jordanian used to make me the most amazing home cooked Middle Eastern dishes when I was younger. I never appreciated it until I went to university in Brighton and didn’t want to eat these unhealthy, tasteless ready meals. So, I put my apron on and started to experiment in the kitchen. Everything was cooked fresh and I developed an understanding and appreciation towards food, and some very happy, well-fed flat mates! My mind and body benefited from eating well. Given we are currently experiencing a national obesity crisis, I think it’s more important than ever to reassess what we are eating. We should be eating all these beautiful natural fruits and vegetables instead of constantly grazing on foods that have effects on our bodies and the environment. With your concept being so unique in the area, do you think Wolverhampton has more potential when it comes to food? Definitely – Wolverhampton has huge potential when it comes to food. Compared to other cities, it’s very difficult to find somewhere to eat in Wolverhampton, especially for vegetarians or vegans or those looking for a healthier option. I really struggle to eat locally and find this frustrating. I believe we need to give people more options than always eating at fast food chains. If we only provide these unhealthy choices it is impossible to make a healthy choice. People are now interested in keeping fit and changing their food diets so we should be offering the people of Wolverhampton a chance to use their palates instead of eating processed food. I believe FEAST is the first step towards this, and offers people in the city an affordable way to eat at least one meal a day that is meat free, fresh, healthy and delicious. I hope others start to see the potential in Wolverhampton and continue to invest in the city’s food industry. If you could suggest one of your dishes to convert somebody who wasn’t sure about veganism, what would you pick? I would suggest the Black Bean Chilli with Nachos. It is so tasty! It is packed with aromatic spices, rich in flavour and completely addictive. Made with crisp peppers, black beans, mixed beans and served with mini garlic nachos, it is so simple but always a satisfying lunch. Whats everyones personal favourite dish from your menu’s so far? Where would you love to see Feast Foods in 2 years time? I would love to have café or coffee shop serving delicious healthy veggie and vegan food and craft coffee. I used to work for a coffee roastery in Brighton and miss having a beautiful coffee now that I have moved back home. If I could bring this to Wolverhampton too, I would be really happy for completely selfish reasons. I would also like FEAST to be doing frequent events and food festivals with our new trailer. Finally, anything you would like to say to the readers? I really believe that Wolverhampton needs and deserves new, fresh and healthy food options. At FEAST, my mission to fill this gap by designing exciting dishes with fresh and nutritious ingredients at an affordable price. 90% of my customers are meat eaters and all of them keep coming back to order FEAST lunches because they feel happy and healthy for eating natural, meat free, delicious food. FEAST gives the people of Wolverhampton the chance to have a choice to eat delicious, nutritious and healthy lunches! I am very passionate about contributing to where I live and hope this can make a real difference. Equally, I look forward to one day being able to provide jobs to people in Wolverhampton who share the same work ethic and passion for food that I have. Thanks to Nadiah for giving up her time to tell us more about Feast foods and helping to diversify options available to the local community. It’s a brave move starting any business but starting up something that goes against the grain is even more bold. I wish her the best of luck in the future and hope you all support her if you can. You can find FF on Instagram for some beautiful examples of their dishes and visit The Feast Foods website to get involved! Bank holidays in the UK tend to fall foul of a particularly unfortunate pattern. The weeks leading up to it will be scorching hot with an unrelenting heat and cloudless sky, then like a flash as soon as the bank holiday is within touching distance the rain starts like a switch has been flicked. Dampening picnic and BBQ plans alike and trapping us in our houses with ITV2 and it’s one thousandth play of Jurassic park 2 or Uncle Buck. That being said it’s not all bad. Theres nothing wrong with rolling with the tide as it were, making lemonade from the lemons we should quite frankly expect by now! Get to the butcher and get something you have fancied cooking for a while, grab a Blu-ray you fancy watching and settle in for some extreme pre-winter comfort food. It’s a win-win situation. For me it was a rib recipe I have wanted to try for such a long time it seems crazy that I haven’t got around to making it yet. I make no secret of being a passionate advocate of year round BBQ and rain or shine I don’t think you can beat biting through the bark of a rich, crispy piece of beef or chicken that is fresh off the coals. Sometimes however it is just not possible for everybody to get out there and fire up the grill, so this is my way of bringing that kind of experience indoors without setting your moms curtains on fire. BBQ Ribs – serves one as a meal or 2 to share.Double amounts if needed. A bottle of your favourite BBQ sauce. I usually make my own but for this I had a bottle of Jim Beam Cherry bourbon BBQ sauce that I wanted to try out. Get a large saucepan full of salted water to a rolling boil and add the stock cubes. Stir until fully dissolved. Pre-heat the slow cooker on ‘low’. Add the ribs to the boiling water and leave for 3 minutes. The water should have a white to grey froth on top of it, this process stops that fatty residue tainting your sauce. Quickly pat dry with some kitchen roll and press the meaty side of the ribs into the ‘rub’. Lay them into the slow cooker and pour in the sauce. Making sure they are well covered. Leave for 4 hours and then half remove the lid for the final 5th hour. By now the sauce will have reduced a little, exposing the end pieces of the ribs and creating a bit of a bark while leaving the meat smokey,loose and almost desperate to slide straight off the bone. Serve with corn on the cob rolled in cayenne, sweet potato fries and plenty of french’s mustard. Some may argue that the fact that you can go and buy hundreds of varieties of pasta off the shelf in any supermarket, is motivation enough to not bother getting flour everywhere and getting your hands dirty to make your own. This is a fair logic however opening up a plastic bag doesn’t come close to the feeling of achievement you get when you are looking at a plate of fresh pasta that you made yourself from scratch, be it tagliatelle, spaghetti or a filled variety it feels great and is incredibly therapeutic. I am, unfortunately, a known sufferer of health anxiety. Not something I tend to shout about but it stands to reason when I have an episode or period of health anxiety that sometimes I need something to give me something to focus on, take my mind off it and realign my state of mind. Making pasta is brilliant for this as I get so involved in it I do feel relief from my stress and anxiety symptoms for a time. Put the flour into a bowl with a teaspoon of salt and make a well in the middle. Crack the eggs into the well and mix the eggs with a fork until thoroughly mixed. Slowly start to include some flour when mixing, going until the egg is combined with the flour. Now, get your hands in there and don’t be scared to get a bit messy. Start to combine the mixture with your finger tips and try and combine as much of the remaining flour as you can (Don’t worry if you don’t manage to use it all). When it starts to look less floury and more dough like, flour your work surface and place the dough on the flour. Knead, knead, knead. I can’t stress this enough. Give the dough a good bashing. Folding, pounding and stretching the dough until it starts to look smooth and silky. Form into a ball and wrap with cling film, pop into the fridge for a minimum of 30 minutes. In a pan of boiling, salted water, add the squash and boil until soft enough to slide off a skewer or fork. Drain of all water and leave to cool, then mash up and add the cheese. Mixing well with a bit of seasoning. Now for the next part I do use a pasta machine, you can hand roll the pasta but technology is there to help us after all. Cut off about a quarter of the dough and flatten it out a little. Pass through the pasta machine on the widest setting, folding at the top and bottom (A bit like an envelope) then passing it through the opposite way. repeat this about 7 or 8 times. You will notice the pasta change in texture as you do it, this might seem a little bit monotonous but it gives the pasta a much better texture and mouth feel or rather ‘Al dente’ as the Italian’s would say. Now put the pasta dough through the machine working your way through the settings until you get to the bottom or penultimate setting. If it gets too long don’t hesitate to cut the dough in half to make it easier to manage, as long as the finished piece of pasta allows you to see your hand on the other side (or read a paper through it as they say) …it should flap when you blow under it, just don’t blow too hard and loose it! The next step is to make sure you have a good piece of pasta in front of you that you are able to fold over horizontally. Simply take your filling with a teaspoon and place it around 1 inch inside the bottom left hand corner, leaving a similar gap in-between each filling right to the end of the pasta, again leaving around 1 inch remaining at the end of the pasta. Brush the bottom edges of the pasta with water and slowly bring the left hand top corner to the left hand bottom edge. Lightly press around each side of the filling to ensure no air remains before working your way along the pasta, repeating the process until finished. Take the ravioli cutter and trim the edges of the whole piece, then go between each filling, making sure its pressed down well. Repeat the process how ever many times you need to with the remaining dough. Each quart should have between an 8 or 10 ravioli yield. In a shallow pan of lightly salted, boiling water, add the pasta and cook for minutes. Pop onto a plate and drizzle with a little oil and sprinkle with a touch of salt and pepper. Enjoy with a salad or on it’s own… but they are a lovely little treat. Tip: Any extra dough left at the end, you can slot on the cutter to your pasta machine, roll it out 7 or 8 times as stated above, working in down to the 3rd or 4th lowest setting and put through the cutter to make tagliatelle or linguine! As you may have seen in my recent post ‘Moyaux than meets the eye’ I went to France in July of this year and to be frank, I adored every second of my journey around the region of Normandy and found inspiration at every turn. The local produce was such good quality I actually left Normandy disappointed that I couldn’t stay longer and learn more about how everything was made and just sit one more time in the summer sunshine with a few different bits of cheese and some fresh bread, slicing tiny slithers of soft cheese away and pairing it with locally sourced cold meats and a cold beer. It really was bliss. While I was there I was inspired to write quite a few recipes as there was plenty of ideas flying in and out of my head when we were exploring the local area but as ever, I am known for my burger recipes so it is only right I try and combine the flavours that Normandy is famous for and fit it between two halves of a bun for you all to experience at home. There are three things that stand out as essential ingredients to this burger and they are Pont l’eveque cheese, Calvados and Brioche. As long as these three things are present then you are onto a winner! So here’s the recipe that screams out Normandy loud and clear to me while celebrating everything I miss about this beautifully wonderful place. VIVA LA FRANCE!…Apart from in relation to the Rugby World Cup of course…. not even a little bit. Happy Friday everyone! The weekend is just around the corner, bake off is in full swing and it looks like we are due some good weather this weekend. This week the BBC’s popular show ‘The Great British bake off’ held their biscuit week, showing off the bakers skills in three specific challenges that incorporate a wide range of biscuit making techniques to show that they deserve another week on the show. My fiancé adores the program and as she is a Teacher, she has time off around the time that the show airs for her summer break, so she likes to bake on ‘Bake off’ day something that relates to the corresponding week on the show. 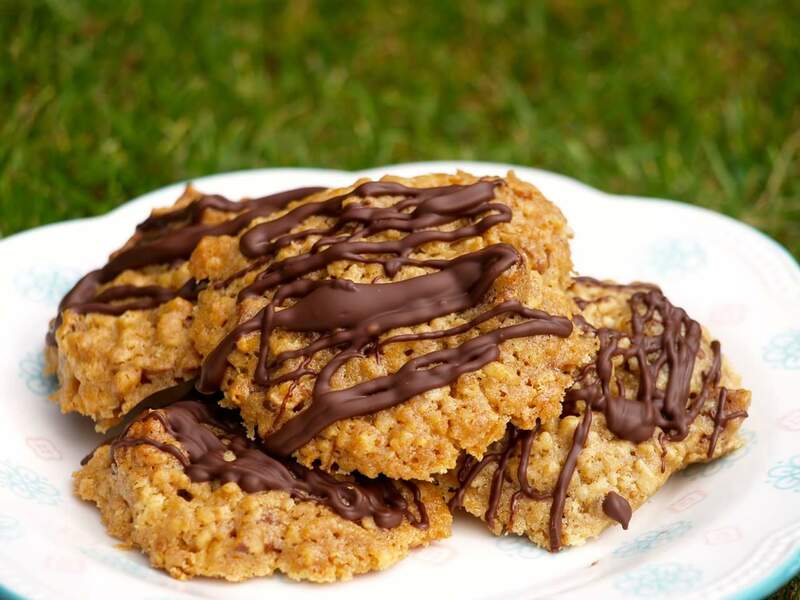 This week I was treated to a chunky, oat biscuit that was sweet, nutty and filling. Great with a coffee first thing at work! Preheat oven to 170°C (150°C fan) mark 3. Lightly grease two large baking sheets. In a large bowl, mix together the cookie ingredients until well combined. Put large tablespoonfuls of the mixture on to the prepared baking sheets, spacing them well apart. Bake for 12-15min until golden. Leave to cool for 10min on the baking sheet, then drizzle with melted chocolate. Serve immediately, or leave to set first. And that is how easy it is! Seriously! Enjoy you weekends all. America has gone through quite the renaissance in terms of the worlds perception of their food in recent years, they are now supremely fashionable due to the popularity of their incredible barbeque recipes. Not a day goes by that I don’t see a new pulled pork product or a BBQ 20 hour beef option added to another menu at the bigger chains or even some of the smaller, more independent cafes and restaurants and for good reason. America knows how to utilise great meat very effectively and create some incredible food. 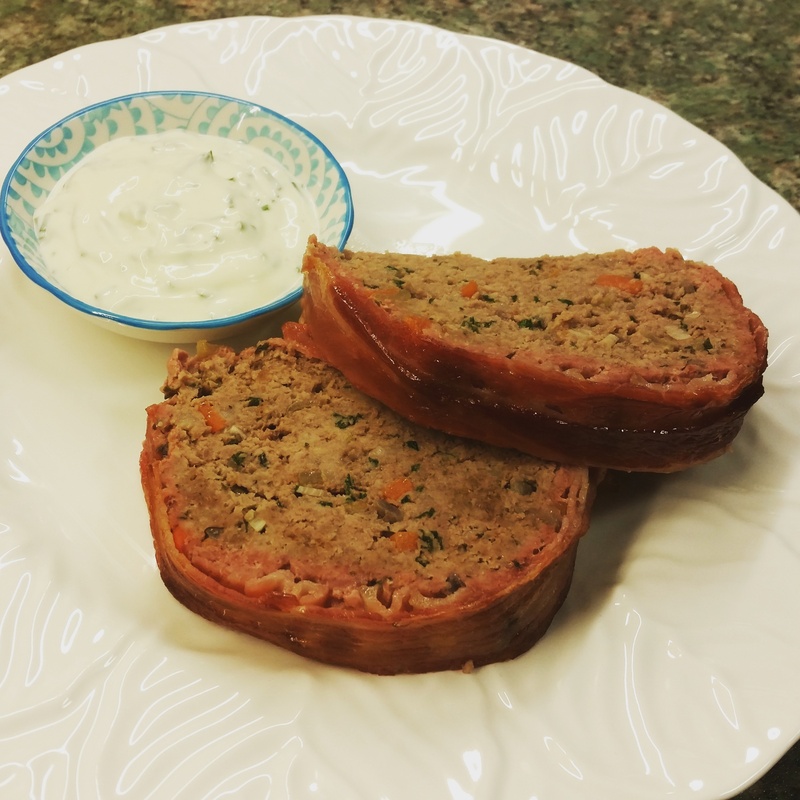 One dish in particular that I have always admired is the quintessential stateside family meal, the meatloaf. 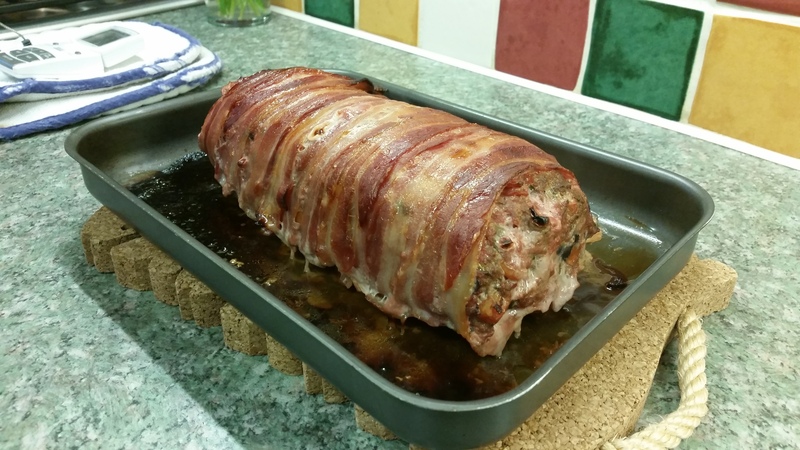 As somebody who grew up in the United kingdom watching shows from the USA I had always heard about meatloaf but never fully understood what it was until a few years ago when I put some effort into research. I have been working on a recipe since then and found a few pointers along the way to get the best from it and to be fair I am very happy with how it turns out now when I make it, as the first ones that I made were dry and a little bland. I didn’t really feel like I had captured the essence of the homely experience that the meatloaf represented to so many families across the pond, until now. 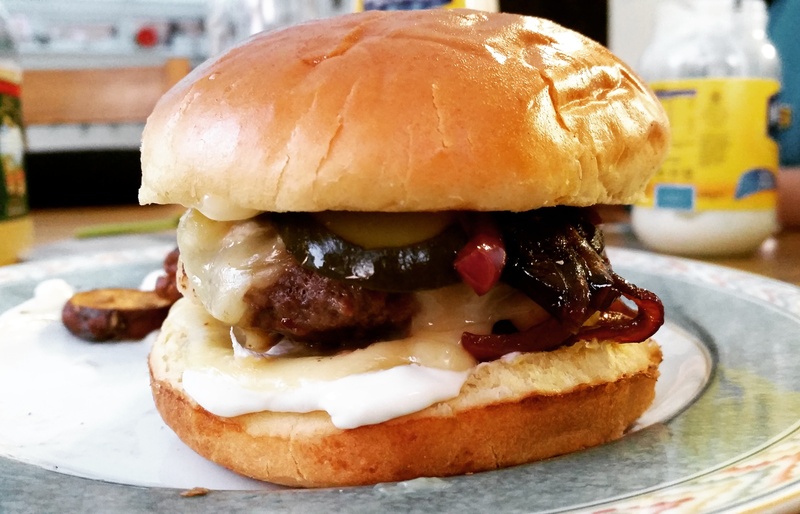 I am happy enough with it to share the recipe for you to try at home! In a frying pan, add 1 tablespoon of oil and add the celery, carrots, onion and garlic and fry until slightly softened and the onions start to become milder in colour. Take it off the heat and leave it to cool. Preheat the oven at 180 degrees or equivalent. In a large bowl mix the beef, pork and sausage meat with the breadcrumbs, egg, parsley and season well with the salt and pepper. Add the now cooled veg from the pan and mix well to combine. In an oiled loaf tin pack the mix in to the top and turn out to reveal a nice uniform shape onto a lightly oiled baking tray. 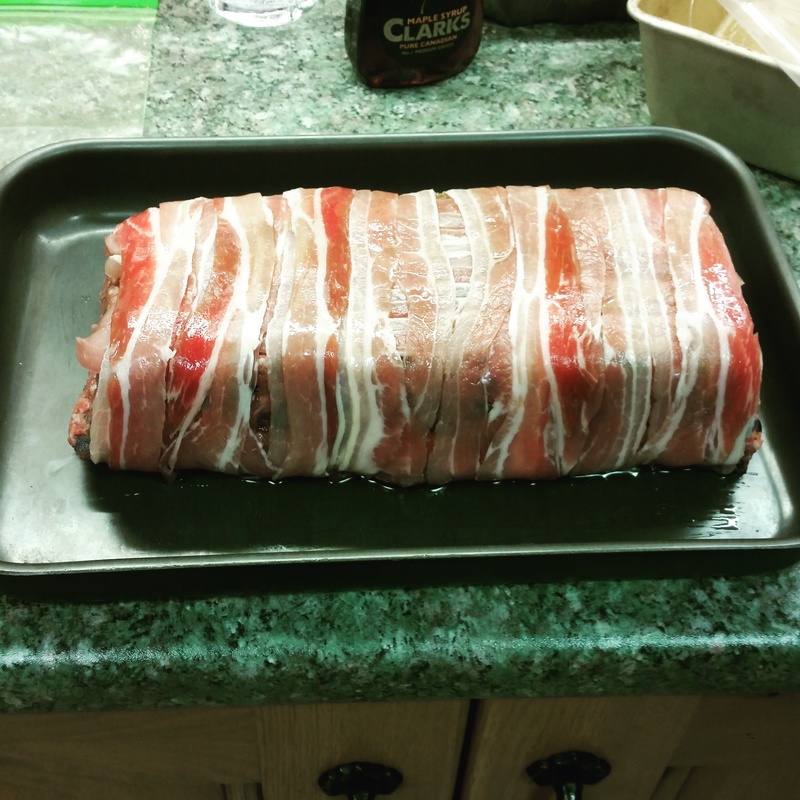 Wrap in the bacon so it is tightly packed in around the sides, leaving both end pieces exposed. Brush the maple syrup over the top of the bacon and around the sides and top with a bit of pepper. Bake in the oven for 45 minutes to an hour. until crispy on the outside or it reads around 77 degrees on a skewer. Remove from the tray carefully, and slice into even slices to serve to your family and friends! Best served with gravy or like I do with a sour cream and chive sauce, roast sweet potatoes and a big salad. Heaven. As always play around with it and see what you can make of it yourself, this is but a blank canvas to get your juices flowing but it does certainly work as it is, so I implore you to give it a try.